WICHITA, Kan. – February 3, 2014 – As the world’s largest producer of ground beef, Cargill wants consumers to have access to more information about this American food staple. Consumer research conducted over the past year led to an initiative that includes an array of informational tools ranging from enhanced labeling on ground beef products in the meat case, to more fact-based material online, as well as a pre-printed, on-pack, quick response (QR) code for mobile devices. “Based on dialogue we had with consumers and retailers, Cargill designed these ground beef communications initiatives to provide information that enhances consumer awareness about ground beef products regarding how they are made and used,” said John Keating, president of Cargill’s Wichita-based beef business. CargillGroundBeef.com website. 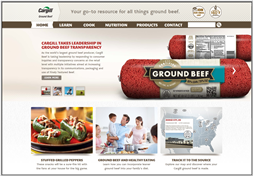 Cargill created this go-to, one-stop, website for consumers seeking information about ground beef. The site contains a wealth of information, including a recipe database and educational resources. Finely Textured Beef. Effective Jan. 20, 2014, all Cargill branded, U.S. produced, fresh, 100% ground beef products containing Finely Textured Beef – both consumer and bulk, including Our Certified™ brand products – began rolling out to the marketplace carrying the declaration “Contains Finely Textured Beef” on the product box end labels. Additionally, Cargill’s Our Certified™ brand ground beef chubs will include the printed declaration on retail packaging. Cargill developed a dedicated website for its Finely Textured Beef – GroundBeefAnswers.com. The site contains a wealth of detailed information and videos about Finely Textured Beef. Additional materials are under development for rollout in the months leading up to the 2014 hamburger-grilling season that traditionally begins with the Memorial Day holiday weekend in May. For more information on detailed rollout plans as well as pictures of our products please visit www.CargillGroundBeef.com.